Cameron Charles is a big espresso fan, but he wanted more control over how his coffee machine created the uplifting drink. So he decided to add a microcontroller to his setup to adjust the temperature control. The controller keeps tabs on the heat, and will tell you to pour your espresso and steam when it reaches a particular temperature. Anything for the perfect pick-me-up! Starting to gear up for Christmas but want to insert some of your geekiness? 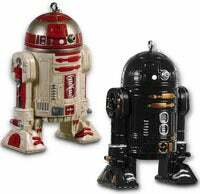 After you finish desinging and building your own Lego decorations, how about picking up some exclusive R2-Q5 and R2-A3 ornaments as well?